TEAC's new £400 micro system supports hi-res audio and wireless streaming | What Hi-Fi? The CR-H101DAB has its fingers in several music source pies and serves them up in a compact, affordable package. 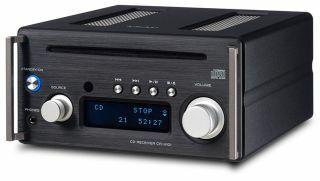 TEAC is aiming to find the sweetspot for consumers who want the convenience of digital music files and the ability to enjoy their CD collection, with the launch of the new CR-H101DAB micro system. On the front you’ll find a slot-loading CD player but round the back you’ll find a digital USB input that supports 24-bit/192kHz hi-res audio from PCs or Macs, and you can also connect smartphones and tablets with the addition of the relevant cable. AptX Bluetooth is onboard for wireless streaming, and there's an FM/DAB radio tuner too. But what would all those features be without the audio performance to back them up? TEAC claims the H101 will have no such problems, thanks in no small part to the Burr-Brown PCM1795 DAC that's found on its £700 UD-501 DAC. MORE: What is a DAC? And does your system need one? This TEAC will upsample any digital audio input signal with a rate of 96kHz or less to 192kHz, while inputs with sampling rates of 44.1kHz and 48kHz are handled by separate clocks, which TEAC says helps keep digital jitter to a minimum. All sources can benefit from TEAC’s HR Loudness circuit which, the company claims, “delivers more impactful low and high frequencies when listening at low/medium volume levels”. Everything is delivered to the speakers by 2 x 20-watts of Class D amplification and there’s also a subwoofer output should you want some extra low-end power. The unit is housed within an aluminium alloy body, and is available in black or silver. The TEAC CR-H101DAB micro system is available now for £400, pitching it squarely at our reigning champ, the Denon D-M40DAB.